If you have clicked through to this post, most likely you are already offering chat support to your clients from your website. Many of us, online companies, are trying to extract better value from different online tools which we are using for business. Chat support tool is no exception. You are probably wondering if you are handling your chat support in the most effective way. How to know if you are using the tool to its maximum potential? Are you not missing anything? 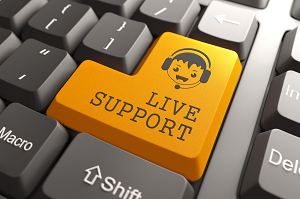 As a live chat support software provider, we have a record of our customers almost constantly missing on three very important features, which could give so much benefit to their business. Perhaps, it is our fault also that we are not marketing these features well enough. Our apologies and an effort to correct ourselves with this post. Below are the three ways to improve your chat support, of which we are almost sure you are missing at least one. Let’s do the audit. As we discussed in our recent post on real-time visitor monitoring, some of our clients are missing on this great feature by adding direct links to the messenger. Direct chat links hardly pass any information about the customer, depriving support operators of valuable information which helps them to provide faster and better quality support. With real-time monitoring enabled, chat support agents can see not only the visitor’s IP and location, but also the current page they are staying at, their referrer, operating system, browser, navigation history through your site and duration of stay on each page. Real-time monitoring also allows to see customers’ membership details by passing information from your website directly into the chat console. The monitoring feature also powers up other important functions of the software, such as Proactive Chat, Co-Browser and Geo-Location map, without which they will not be available to support operators. Have you checked yet if visitor monitoring information is available to your agents? If so, and you have discovered that it is not being passed, you can fix this by adding our Recommended Fully Featured Graphics Chat Button Code or Hidden Code for Visitor Monitoring, both of which support visitor tracking, to all of your website pages. The difference between the two codes is that the first one will display the chat button on your website, and the second one will only pass the monitoring information without showing the chat button. Both codes are available on the Chat Button Codes page in your account Control Panel. 2. Adding live support link to your email signature. It’s no secret that although many companies are using chat support now, they did not say goodbye to the good old email support. Email support is still as in demand as ever. Have you ever thought about modernizing your email support by adding a direct chat support link to your email signature? Just imagine yourself as a customer who is having a bit complicated problem and you are emailing support back and forth. Then suddenly you see a direct chat link through which you can address your problem and get it solved there and then. Wouldn’t it be fantastic? For sure, it would. Adding a chat link to your email signature will help to increase customer engagement, solve the customers’ issues more effectively and will boost the popularity of your chat support. Are you asking how to make this happen? We have a bunch of instructions on how to edit your email signature in different mail applications and insert your chat link there. Please refer to our blog post on email marketing. 3. Adding live chat to your social media profiles. According to a Constant Contact survey, 82 percent of small businesses and non-profit organizations in the US use multi-channel marketing to promote themselves. They confirm that multi-channel marketing helps to increase customer engagement. Obviously, if you are looking to promote your support service and in this way attract more clients, it is a good idea to market your live chat across different channels. One of tools for increased customer engagement, often underutilized by most companies, is to add their support links to their social media profiles, their blogs and other places of their company’s online presence. It is fairly easy to add a chat support link to your Facebook profile, check out our “how to” instructions here. Even easier it can be accomplished on other social media platforms, such as LinkedIn, GooglePlus and Twitter. In addition to increased engagement in chat support, it will add more weight and professionalism to your social media profiles. Have you missed all three or only one or two of the above mentioned possibilities? These are powerful tools to extract better value from your chat support, bring in more customers and increase their satisfaction with your support. Ok, it may be a little bit of a job for you for the upcoming weekend to bridge the gaps and make sure you have real-time monitoring enabled and chat links added to your email and social media. It will pay off though, no doubt. So just go and get your hands to it! This entry was posted in Articles, Best Practice, Tips and Tricks and tagged adding live chat to email, chat support best practice, chat support on social media, how to improve chat support, how to increase engagement in chat support, increasing efficiency of chat support, real-time visitor monitoring. Bookmark the permalink. I feel adding live chat to your social media profiles will improve customer engagement considerably. When your chat representatives receive positive feedback from online customers, you can ask them to like your facebook page and also leave their comments. Hello Dirck. Thank you for your comment. I agree with you. Adding live chat to social media contains benefits for both channels and ultimately, helps to create a stronger connection with the customer. What would be the best chat opening response? Its for both a user that has presented an issue and a user that did not present an issue.